Falconry isn't a hobby; it's a lifestyle. So states the New York State Falconry Association's website. Getting involved in the ancient art of hunting with birds of prey means not only a huge commitment of time and devotion, but also obtaining licensing. Before getting started, find out the rules regarding falconry in your state. As of 2013, falconry is not permitted in Hawaii, Connecticut or Delaware. To hunt with a bird of prey, you must possess a state and federal hunting license. Obtaining such a license involves passing a written test involving information on raptor care, training and veterinary needs. Once you pass, you must become an apprentice to a master falconer who agrees to sponsor you. A falconer's apprenticeship lasts at least two years. For more information, contact your state wildlife agency. Make no mistake: these birds of prey are not pets. A licensed falconer must trap his raptor, most commonly a red-tailed hawk or American kestrel, in its first year of life and already flying. Only master falconers, those with at least seven years' experience in the field, can trap other species or birds that have not left the nest. Master falconers can also purchase captive-bred birds. Basic falconry supplies include a jess, equipment consisting of a grommet and anklet, along with a removable strap to attach it to a swivel. You'll also need a good-quality leash or tether and heavy-duty leather gloves, or gauntlets. You can't use a commercial birdcage to house your raptor. The mews—the indoor and outdoor facility housing the bird—must meet state requirements. Before you can trap a raptor to reside in your mews, it must be inspected and passed by a state fish and wildlife representative. At minimum the indoor mews must have dimensions of 8 feet in each direction, with a door for access. It must contain at least one window on the eastern or southern side for ventilation and sunlight. Both indoor and outdoor perches must be strong and solid enough for the bird to safely grip. The outdoor mews must be large enough that a tethered bird can attempt to fly without hitting its wings on the sides or top. In addition to a constant supply of fresh, clean water, in a container suitable for drinking and bathing, you must provide your bird with a daily source of meat. Preferably your bird should fed raw meat from the same kind of animal he would catch in the wild. If that's not possible, you can purchase frozen mice or quail and feed the thawed bodies. To keep a raptor, you must train this wild creature to accept you as his only source of food. To do this you must spend hours carrying the tethered bird on your glove, feeding it there as well. As trust builds, the falconer places the tethered bird a short distance away and urges the bird to come to him, rewarding the effort with food. Over time the distance increases. 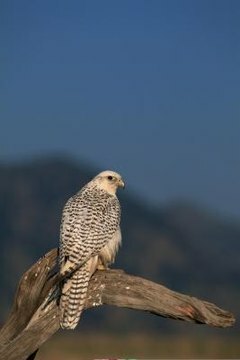 Once the bird easily flies to the falconer, he can be taken hunting and flown freely. Often falconers use hunting dogs to drive game into open areas for the raptor to catch. Birds of prey aren't hunting dogs—they will not bring prey back to the falconer. The falconer must be in the area when the prey is killed, taking the downed animal and giving a raw meat treat to the raptor. Plan on hunting your bird at least three times a week for several hours each time. You must have access to federal or state game lands or permission to hunt on a private landowner's property. All local hunting regulations apply to the sport. North American Falconers Association: What Is Falconry? Did Pigeons Really Carry Mail?